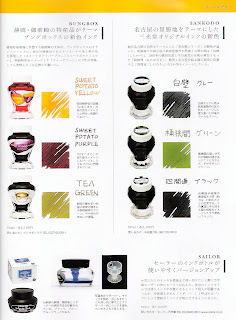 Shumi no bungu bako is a magazine published three times a year in Japan by Ei Publishing. Because of its superior quality, it could easily be called the Rolls Royce of publications for pen and ink enthusiasts, and in fact for all those with interest in anything related to stationery. Its thick, high-gloss pages with sumptuous photographs and intelligent writing cover topics from all corners of the stationery world. Chief Editor, Shigeki Shimizu, leaves little out in informing readers of what’s available in the market, though usually at a price. 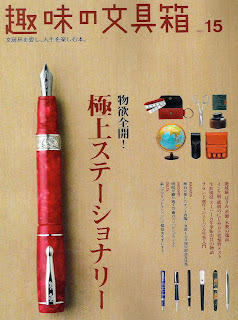 Which is to say, what you find in the pages of Stationery Hobby Box (my clumsy translation of the magazine’s Japanese title) is not inexpensive pens, ink and notebooks. It is a long way from being a catalog of goods you would find at Staples or Office Depot. Advertiser names in the magazine read like an international ‘A’ list of pen, ink and paper manufacturers. 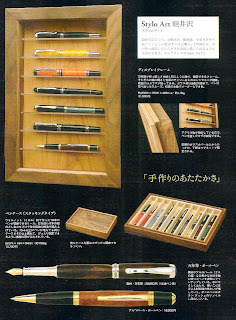 Rather than long articles on a specific topic, most of Stationery Hobby Box is devoted to introducing design and innovation, and reinforcing the continuance of traditional and vintage designs, with short descriptive passages beside the numerous photographs. 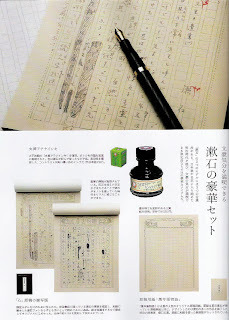 However, special features are always included, such as those in the Volume 15 edition on father and son nib masters, Nobuyoshi and Yukio Nagahara and the comprehensive look at blue inks on a wide variety of paper. My only problem with this magazine is that I’ve yet to let a new edition pass without ordering something, without spending more money to support my own hobby box of pens, inks and paper. Published three times a year by Ei Publishing Co., Ltd.
That is amazing. I have to see if Kinokuniya carries it. What’s in a Biker’s Pocket?